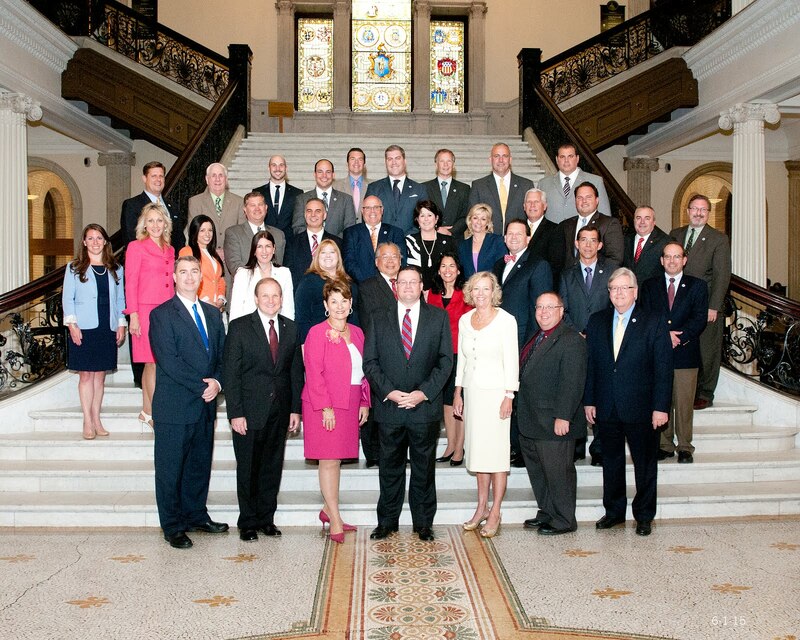 Led by House Minority Leader Bradley H. Jones, Jr. (R-North Reading), the House Republican Caucus joined their colleagues in the Massachusetts House of Representatives and State Senate in passing a balanced Fiscal Year 2013 (FY13) budget, free of any new taxation proposals. The $32.5 billion FY13 budget, which passed with bi-partisan support, includes multiple House and Senate Republican-led provisions aimed at increased oversight for government-led assistance programs, job creating initiatives through education, and enhanced Local Aid for our cities and towns. The continued narrative from Democratic leaders is the need for substantive job creating legislation. By coupling this goal with the integral role that education plays in job creation, House Republicans secured provisions in the FY13 budget derived directly from their GOP Jobs Package to empower our state’s vocational schools. The adoption of these provisions demonstrates a strong willingness from House Democrats to embrace common sense Republican-led jobs proposals. The inclusion of this language will help to produce a highly-trained and well-rounded workforce that meets the needs of Massachusetts’ employers. The FY13 budget, which has been sent to Governor Patrick for his approval, also includes provisions aimed at helping our municipalities. By creating a new funding mechanism for the Community Preservation Act (CPA) Trust Fund, we are enhancing the Commonwealth’s ability to provide a greater match for community preservation monies raised by cities and towns. Furthermore, allowing cities and towns to fund their local CPA account with other municipal revenues, including private donations, will provide an alternative for communities that do not wish to implement the traditional 3% property tax surcharge. These measures not only sustain the Commonwealth’s commitment to existing CPA communities, they encourage additional cities and towns to adopt the Community Preservation Act. In an effort to combat ongoing deficiencies with the taxpayer-funded Electronic Benefits Transfer (EBT) program, the final FY13 budget includes provisions to limit on the type of businesses where EBT cards can be used, and to require an independent commission to develop recommendations on improving the cashless benefit system. Additionally, to combat the cost of the nearly 20,000 EBT cards lost each month, the House and Senate agreed upon language requiring the Department of Transitional Assistance (DTA) to charge recipients for replacing lost EBT cards. Noticeably absent from the Conference Committee language was a provision, offered by House Republicans and adopted in the House version of the budget, which would have prohibited out-of-state EBT card use, with the exception of states contiguous to Massachusetts. • Punishment and fine structure for people in possession of fake identification and/or permit. Furthermore, the Governor will have the opportunity to sign into law a requirement which calls for MassHealth to utilize the federal Systematic Alien Verification for Entitlements (SAVE) system to verify the immigration status of all applicants who apply for public health benefits. This new state system must be setup and fully functional by July 31, 2013. In an ongoing attempt to make healthcare more affordable in Massachusetts, Republicans ensured the inclusion of a provision to allow individuals to use coupons for their prescription drug purchases if they have either failed on the generic drugs or if there is no generic drug available. This will help our residents purchase certain drugs they may not have been able to afford otherwise. As promised to the taxpayers, the budget sent to the Governor also includes two Republican-offered amendments addressing increased transparency and accountability in the public sector. Open Checkbook, established under the increased transparency guidelines in the Fiscal Year 2011 budget, will be updated to include information relative to quasi-public entities, municipalities, and non-profits that receive funding from state agencies. Additionally, non-profit organizations with over $5 million in revenues will be required to establish an independent audit committee, similar to the requirements under the federal Sarbanes-Oxley Act of 2002. Unfortunately, not all common-sense approaches were embraced by the Democratic majority. In what has become a yearly effort by the Republican Caucus, an attempt to gradually roll back the state sales tax to 5% over the course of 3 years from the current 6.25%, with zero impact on the upcoming fiscal year, was defeated at the hands of the Democrats. While the Democratic-run House felt no need to study a proposed increase to the state sales tax just 3 years ago, the majority party was strangely insistent on studying the effects of a rollback this year. By defeating this proposal despite the efforts of Republicans, the majority party has forgone yet another opportunity to put money back into the taxpayers’ pockets. Also absent from the final version of the state budget was a Republican-crafted 11 member Special Commission charged with analyzing and reporting on the activities, practices, and potential changes to the Department of Unemployment Assistance and the unemployment insurance program. The Commission's purview was far-reaching and specific. The intent was to create transparency and affect meaningful change in the current unemployment insurance system, which has not been thoroughly reviewed since the early 1990s and has come under intense scrutiny in recent months for allegedly questionable practices. Finally, the state’s continued reliance on reserves - $400 million for Fiscal Year 2013 - to balance the budget underlines the Commonwealth’s structural deficit. While we have made meaningful gains to assure the balance in the Rainy Day Fund’s grows, constantly drawing on savings year-after-year to meet spending needs is a practice we cannot and should not continue to rely upon. Having been approved by both the House and the Senate, the final version of the FY13 budget is now before the Governor for his approval.